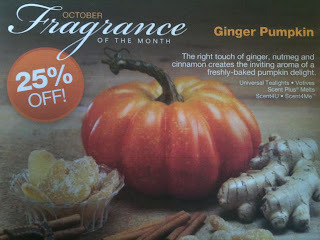 Welcome to the PartyLite by Tiffany Ginger Pumpkins Candle Giveaway hosted by The Saving's Wife. Tea lights & Votives is the inviting aroma of a freshly-baked pumpkin delight packed with the right touch of ginger, nutmeg and cinnamon - perfect for layering fragrance and creating multiple points of light with our beautiful selection of home accents. Also available in all of PartyLite's exclusive fragrances and featuring our patented Universal tea light cup, tea lights will completely liquefy while burning. Tea light cup is recyclable. Burn Time: 4-6 hours and votives 8-10 hours. Enter the giveaway below. This is also fragrance of the month and can be ordered at a 25% discount on the Partylite by Tiffany Website. Giveaway ends on November 11, 2012. Open to US residents only.Winner will have 72 hours to respond to email their Full Name, Email Address, Telephone Number and Shipping Address or a new winner will be chosen.